After arriving on my United flight from EWR, I needed to get online right away, so I went to the United Club that was close to my arrival gate. 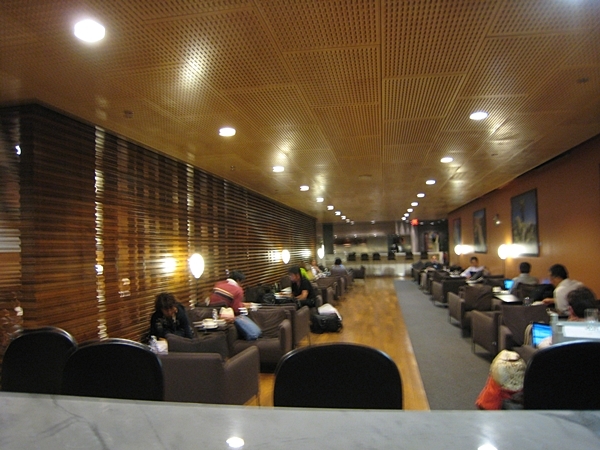 Since I had arrived on a United domestic flight, I wasn't entitled to use the lounge based on my ticket, but that wasn't a problem since I was able to use one of my two complimentary United Club passes that come with the United MileagePlus Explorer card. I worked there for about 5 hours, until they kicked us out at 11pm, then took the shuttle to the international terminal, for my ANA flight. While there was initially a long line, it sped up considerably after my ticket had been checked and I was waved through to priority security screening. Since there was still about 45 minutes until boarding, I visited the ANA Lounge. While it was fairly crowded (I believe Premium Economy passengers are also entitled to use it) the food options, even though I was there just before closing, were better: mini sandwiches such as ham and cheese, crab salad, portabella mushroom; beautifully arranged fresh fruit (pineapple slices, strawberries, melon, etc.) and even soup and chicken paella as hot food if you wanted it, not to mention espresso drinks from a machine and plenty of cold beverage options. I just had some fresh fruit, since I was still full from my lunch on the United flight. For an overnight flight leaving at 1am, the flight was fuller than I'd have expected–about 75% full in business class, not sure about economy and premium economy. 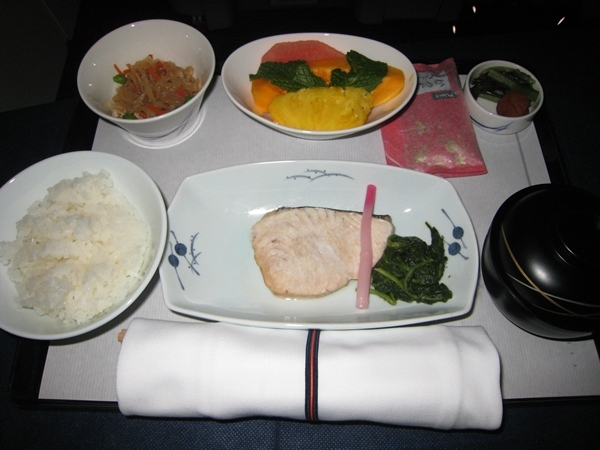 After takeoff, the flight attendants distributed menus. 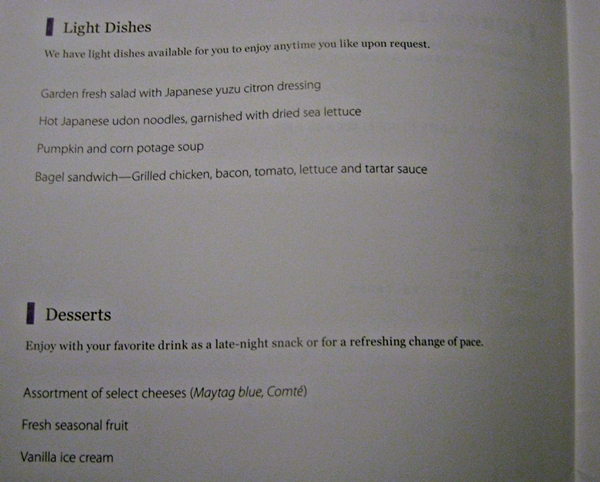 None of the light dishes looked that exciting, but I didn't mind since mostly I wanted to sleep. 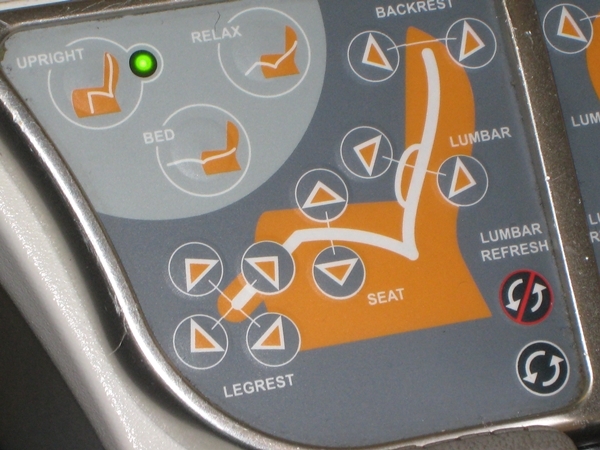 The seat controls were easy to operate, and they were discrete modes, that is, if you pressed any of them just once, it would move the seat into a predetermined position; you couldn't adjust it to a position that was in between any of the choices. 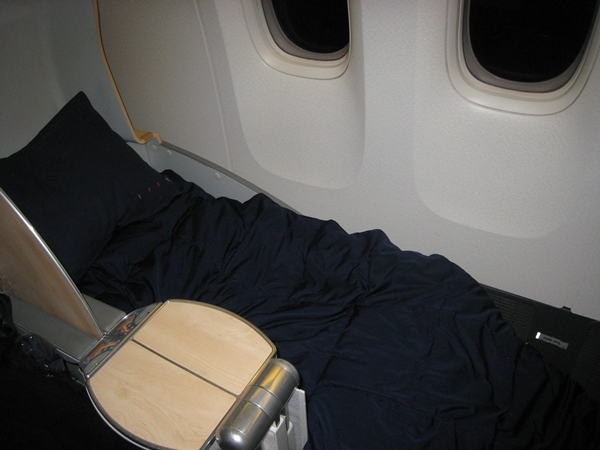 I turned the seat into the angled flat bed, which at first seemed ok, but I never did get any sleep in it, even with a sleeping pill–it ended up just being too uncomfortable to me, even using the blanket from the neighboring seat to make it softer and an extra pillow. I also think that it would be way too short for someone much taller than I am. I'm only 5'7, so I'd hate to think how my husband or anyone over 6 feet tall would fare. 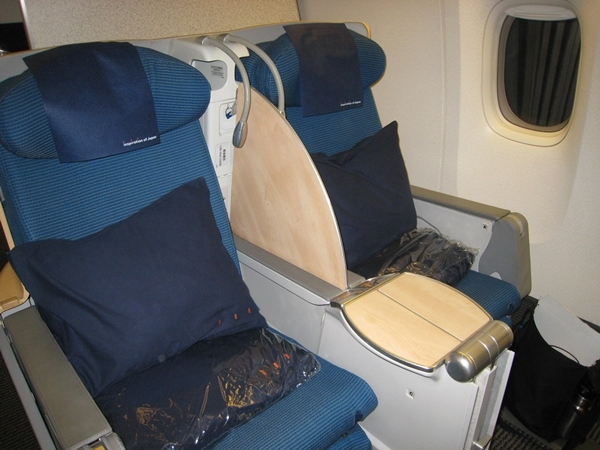 I knew the seat would be angled flat and that I might not sleep, though, so can't really complain. I'm sure some people manage to sleep relatively fine in these seats, it's very individual. After I gave up on sleeping about 2/3 through the flight, I was finally hungry, never having had dinner. 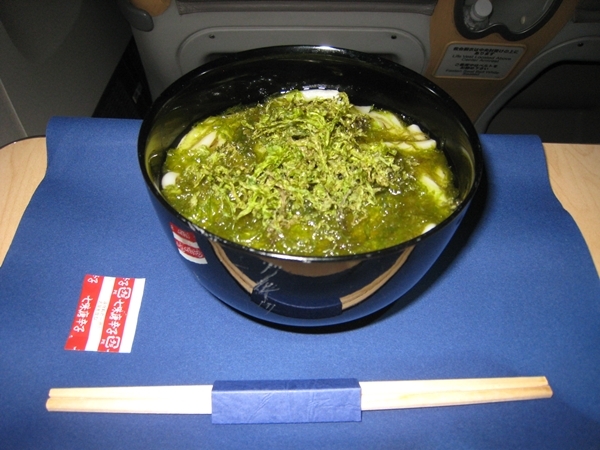 A flight attendant saw I was stirring and I asked if I could have some udon. I must say, that for such a simple dish, thick noodles in a hot broth with an abundance of seaweed, it was really delicious and hit the spot. Having lived in Japan and eaten plenty of great Japanese food, I wasn't expecting much from airline food, but this really hit the spot. About an hour or so later, we were asked our breakfast choices: the Japanese meal set or Western meal set. The Western meal set was a cheese and herb omelet with ratatouille, bread rolls and fruit, so I chose the Japanese set from the menu. I can't say I was a huge fan of the fish, which was rather firm and a bit overcooked, but I did enjoy all the various Japanese pickles that came with it, and also, once I figured out what it was, the bonito (dried fish) topping for the rice. Service-wise, the cabin attendants were very attentive and very Japanese, by which I mean very polite, kind, and feminine. They even tended to speak Japanese to me, even though I've sadly forgotten pretty much all my Japanese. 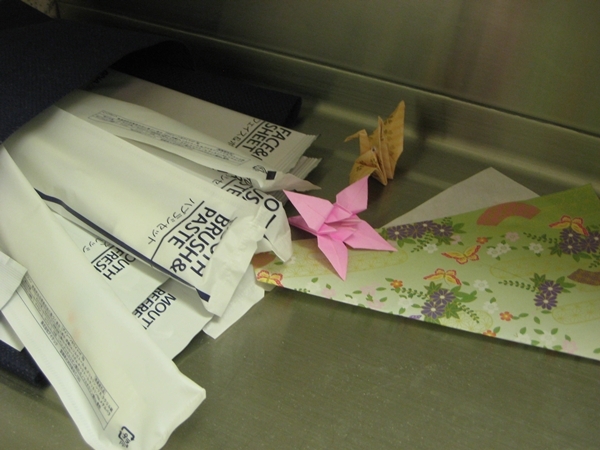 I'm clearly not Japanese, but perhaps they thought I was a foreigner living there, so I'd understand it. The verdict on ANA Business Class: Service was great and food was fine, but for me, the angled flat seat is a dealbreaker, especially on an overnight flight of this length. Since it's only a few more United miles for a first class award if you can find availability, I'd definitely recommend that, over business class, at least until/unless ANA puts flat bed seats in business class. While I booked this trip as part of a mini round the world trip as a discount Aeroplan award deal back in early December 2011 when Aeroplan had a freak award sale, your best bet now to fly ANA is to use United miles, because Aeroplan now imposes fuel surcharges on most of its partners apart from United, Swiss, US Airways and Air New Zealand. 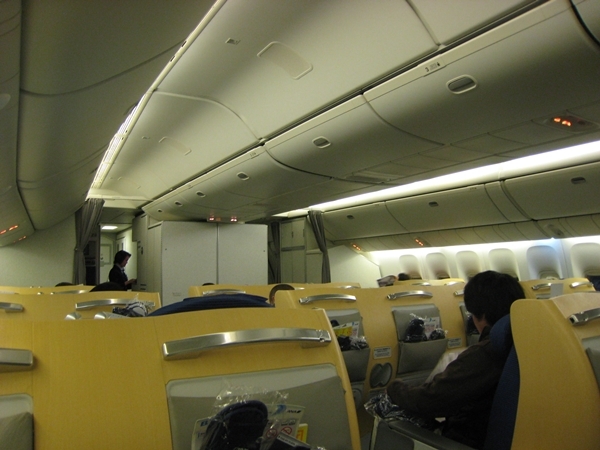 Business class is 60,000 United miles one way, and first class is 67,500 United miles one-way (but note that ANA does not offer first class on the Tokyo Haneda route, only to and from Tokyo Narita). Also, for some reason United is currently not showing accurate availability, so make sure you check out How to Use ANA to Search for Star Alliance Award Space. How to earn: Earn Ultimate Rewards points (which transfer 1:1 to United miles) with cards such as the Ink Plus or Sapphire Preferred, or earn United miles with the United MileagePlus Explorer card.